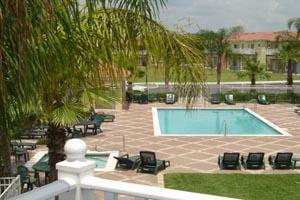 Great townhouse very close to Disney for up to 7 persons, 3 bedrooms and 2 bath in a security gated community with community pool and jacuzzi/spa and free Wi-Fi. Our house has a great location with the balcony overlooking the pool and Jacuzzi which is heated all year. 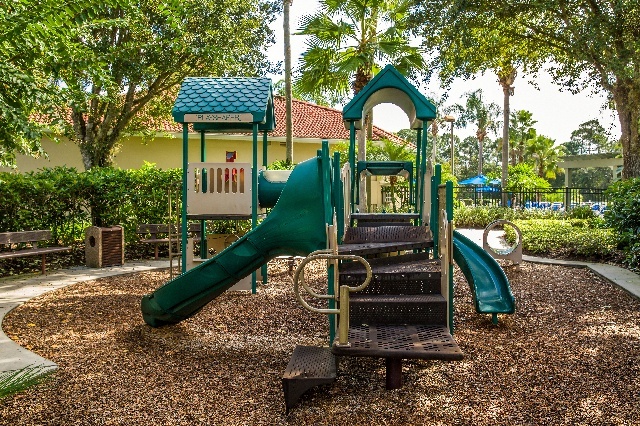 The resort has a great location one of the closest villa complexes to Disney and has 2 pools, 2 Jacuzzis, sauna, tennis courts, volleyball, children playareas, gym and games room, there is also a tiki bar next to the clubhouse pool. Our Emerald Island Townhouse is fully air conditioned and the living space is on two floors, with en-suite master bedroom, family bathroom and two further bedrooms on the top floor. The ground floor consists of kitchen, dining area, lounge, laundry room and a separate toilet. The Master Bedroom with en-suite facilities has a queen size bed, flat screen TV with digital TV, dressing table and a built in wardrobe, also there are patio doors which lead out to a balcony over looking the heated pool and spa. Bedroom 2 has a queen size bed, built in wardrobe, dressing table, TV and bedside cabinets. Bedroom 3 has a double bed and a single bunk above. It has a large built in wardrobe, TV and a 4 draw chest. There is also an extra put me up bed if needed. The Family Bathroom has a bath with shower, toilet, fitted wash basin and plenty of cupboard space. The Kitchen is fully fitted with cooker, microwave oven, dishwasher, a waste disposal unit and a large fridge freezer. There is a kettle, coffee maker, toaster, electric tin opener and ample crockery and cutlery. Basically there is everything you can think of from a chopping board to a 10 piece utensil set. The Dining Area has a large table with seating for 6 and there are also 2 kitchen barstools for extra seating if needed. The Lounge Area is furnished to the highest quality with two sofa's, coffee table and matching furniture. A 42” flat screen TV with Cable, DVD, playstation 2 and a radio CD player for your enjoyment, plus there is also free wi-fi. Patio doors lead out to the porch, pool and spar area. The Laundry Room has a washing machine, dryer, iron and ironing board, an upright vacuum cleaner and a dust pan and mop. There is also another toilet downstairs with a fitted wash basin and more storage space. All bed linen and towels are provided.